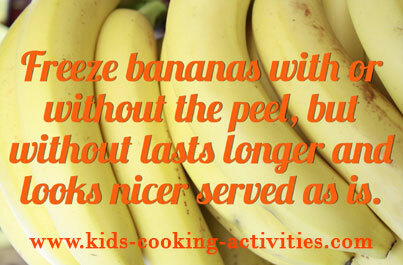 Banana facts, an information sheet for kids cooking activities. Banana facts and general information about bananas. Bananas are available year round. Bananas grow on a giant plant that looks like a tree but it is not a tree. The plant flowers and as each leaf of the bud opens it reveals a double row of flowers. These flowers become individual bananas. Each row has 15 or more fingers (bananas) and that makes up a hand. Each stem develops 7-10 hands of bananas. They are picked when they are green and shipped all over the world. Pick bright yellow bananas without bruises. Some people prefer their bananas greener than others and some darker so it is a matter of preference. Darker and brown bananas make the best banana bread. Store bananas on the counter. Eat as is. They can also be grilled and baked. 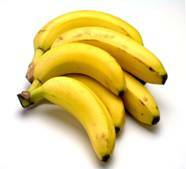 You can freeze bananas if they are overripe. Freeze whole and use for breads or muffins when baking. Bananas are a great source of potassium. They are also high in Vitamin C and fiber. They are good for digestion and help reduce the risk of cancers as well. Mash bananas and add soda. In a separate bowl cream sugar, shortening, add eggs 1 at a time, add salt, and vanilla. Then flour. Stir in banana mixture and fold in nuts. Pour into 2 greased loaf pans. Bake in the oven at 350 degrees for 40-45 minutes or until toothpick inserted into middle comes out clean. Spread peanut butter on hotdog bun. Place peeled banana on bun. Spread more peanut butter on top. Top with chocolate chips. 1. Cut the bananas to little circles. 2. Mix the nestle cream and condensed milk in a bowl. 3. Place the bananas as you want in a presentable plate. 4. Spread the the mixed sauce into the bananas. 5. Put the toothpicks on top of the presented bananas. Roll bread flat with a rolling pin. Spread with peanut butter and place peeled whole banana on top of peanut butter. Roll up and eat as is or cut into chunks. Put the banana, the strawberries and the yogurt in the blender. Then mix them together and then you have a strawberry banana smoothie. Share your banana facts and recipes.